When it comes to car problems there is often signs of trouble long before you end up stranded on the side of the road or suffering from a very obvious problem. By paying attention to the signs of auto trouble you can make an appointment with your local auto shop to get these small problems taken care of before they grow worse. These are the common types of warning signs you may experience if there is trouble aboard your vehicle. Strange noises can be caused by all different types of car problems. Low brake pads can cause a grinding noise when slowing, a grinding noise when shifting can indicate low transmission fluid and a knocking noise coming from underneath the hood is a clear indication of worn engine bearings. Any time that you feel your car shaking or a specific part vibrating you will want to get to the auto shop. For example, brake trouble can result in a shaking brake pedal, an exhaust leak could cause the gas pedal to vibrate or an alignment issue could cause the steering wheel to shake back and forth. There are lots of different smells caused by automotive issues. If you drive a stick shift and catch a whiff of campfire it could be time for a new clutch or a dirty laundry smell could indicate mold in your AC system. Your dashboard is full of different lights that indicate problems. The most notable one being the check engine light, but others include the ABS (brake) light, oil pressure light, tire pressure light, battery light and more. If a dashboard light comes on get to the repair shop immediately to prevent problems from getting bigger, which would of course result in a need for more extensive and expensive repairs. 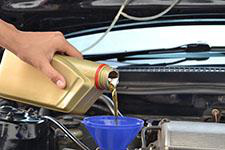 At the first sign of trouble head to Hye Tech Auto for expert auto repair in Covina. Our expert techs have access to the latest diagnostic and auto repair equipment, ensuring fast and efficient service. To learn more, request a quote or to schedule professional auto repair in Covina or the surrounding area give our friendly team a call at (626) 332-5452 today!